A well-constructed resume can punch your ticket to your next job. This sample will help you build your resume on a solid foundation. Looking to get hired for construction jobs? To help support your job search, you need to have a solid foundation—a well-built resume. 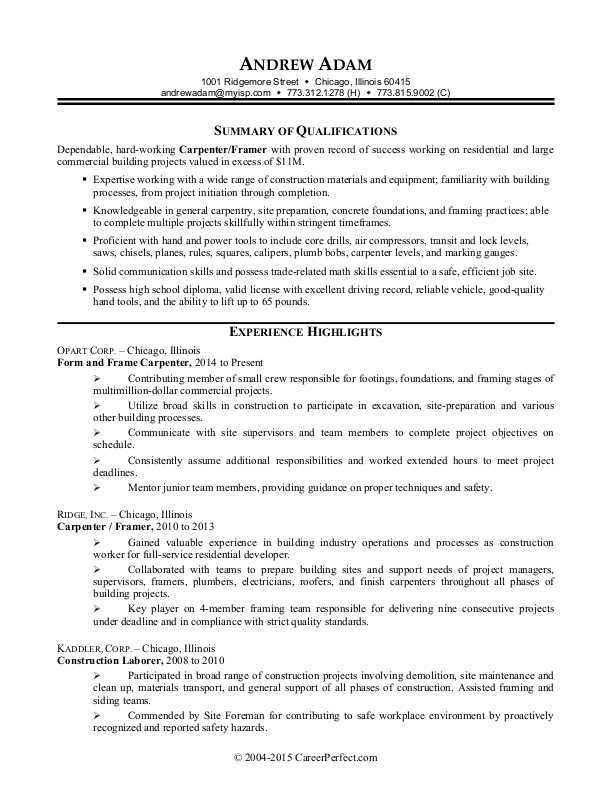 Get inspired by viewing this sample resume for a construction worker below, and download the sample resume for a construction worker in Word. Jobs for construction workers are projected to grow by 12% (or 180,500 jobs) from 2016 through 2026, which is faster than average, according to the Bureau of Labor Statistics (BLS). You'll find the highest level of employment for this job in the following states: Texas, California, Florida, New York, and Pennsylvania; and in the following metropolitan areas: New York City, Houston, Atlanta, Dallas, and Los Angeles. As a construction worker, you can expect to earn a median wage of $33,450 per year, or $16.08 per hour, according to the BLS. Additionally, you can learn more about construction careers and search for construction jobs on Monster. Dependable, hard-working Carpenter/Framer with proven record of success working on residential and large commercial building projects valued in excess of $11M. Expertise working with a wide range of construction materials and equipment; familiarity with building processes, from project initiation through completion. Knowledgeable in general carpentry, site preparation, concrete foundations, and framing practices; able to complete multiple projects skillfully within stringent timeframes. Proficient with hand and power tools to include core drills, air compressors, transit and lock levels, saws, chisels, planes, rules, squares, calipers, plumb bobs, carpenter levels, and marking gauges. Solid communication skills and possess trade-related math skills essential to a safe, efficient job site. Possess high school diploma, valid license with excellent driving record, reliable vehicle, good-quality hand tools, and the ability to lift up to 65 pounds. Contributing member of small crew responsible for footings, foundations, and framing stages of multimillion-dollar commercial projects. Utilize broad skills in construction to participate in excavation, site-preparation and various other building processes. Communicate with site supervisors and team members to complete project objectives on schedule. Consistently assume additional responsibilities and worked extended hours to meet project deadlines. Gained valuable experience in building industry operations and processes as construction worker for full-service residential developer. Collaborated with teams to prepare building sites and support needs of project managers, supervisors, framers, plumbers, electricians, roofers, and finish carpenters throughout all phases of building projects. Key player on 4-member framing team responsible for delivering nine consecutive projects under deadline and in compliance with strict quality standards. Participated in broad range of construction projects involving demolition, site maintenance and clean up, materials transport, and general support of all phases of construction. Assisted framing and siding teams. Commended by Site Foreman for contributing to safe workplace environment by proactively recognized and reported safety hazards. As a construction worker, you're used to building things—but a resume probably isn't one of them. Could you use some help putting together a resume that can support your job search? Get a free resume evaluation today from the experts at Monster's Resume Writing Service. You'll get detailed feedback in two business days, including a review of your resume's appearance and content, and a prediction of a recruiter's first impression. Let the experts at Monster help you build an awesome career.